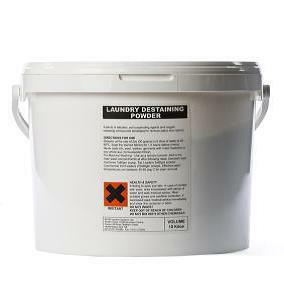 Laundry Destaining Powder is a concentrated powder laundry destainer specially formulated for use in commercial, healthcare and on premise laundries. • Excellent destainer for all types of fabric, including coloureds. • Enhances fatty/oily soil removal (when combined with mainwash detergent). • Results in minimal fabric damage and colour fading when used according to user instructions. • Enables bleaching at lower temperatures; saves energy and prolongs fabric lifetime. • Provides good hygiene, provided the temperature, pH conditions and contact time are correct.